3S 1300mAh, 5g HXT servos (one on elevator, in the fuse, one each on ailerons in the wing). 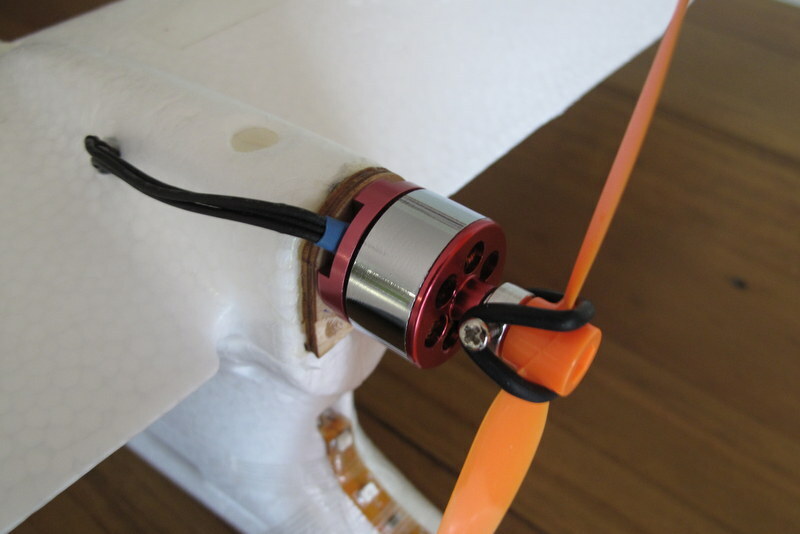 C20 motor 2050kv from memory, 12A ESC. All up weight, just a smidge under 340g. So yes it is carrying something, but it's not FPV gear. 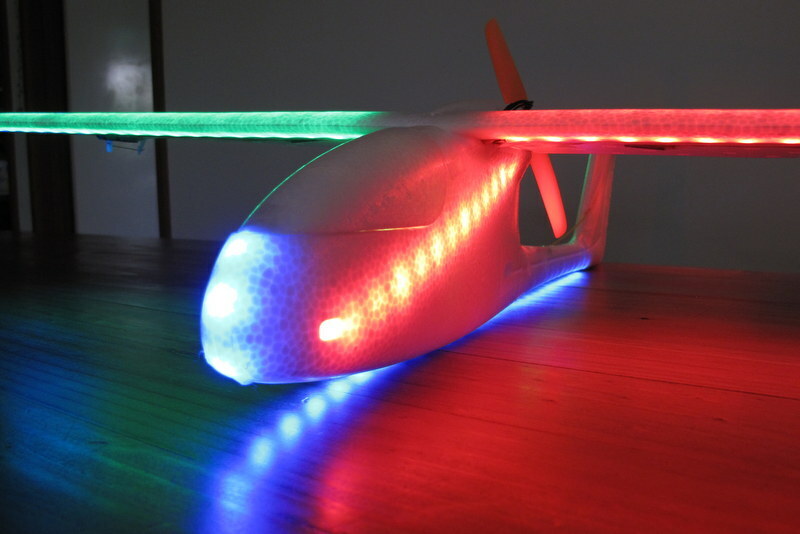 125 LEDs on this puppy (including the Rx LED and lighting ESC LED), except only three point outside. The rest are mounted internally by being let into the foam, so the LED lights up the foam which makes for a more streamlined airframe, and I think illuminates the airframe better. 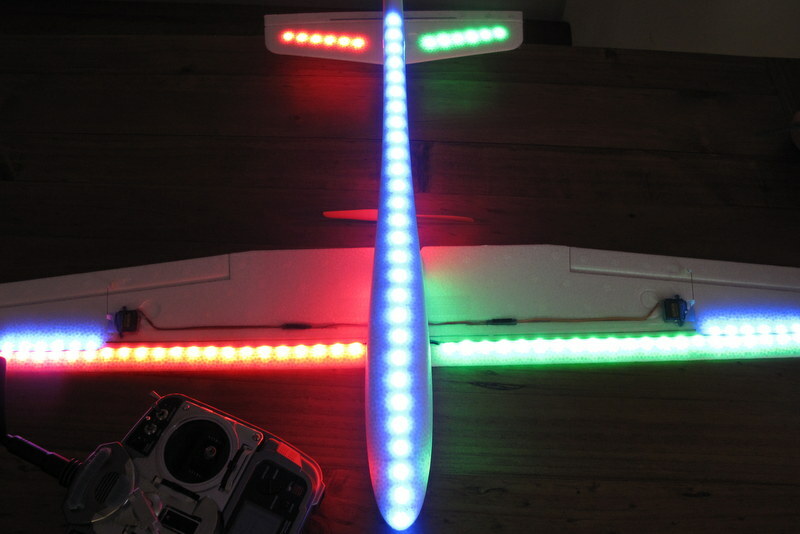 The 3 under the prop are an attempt to light up the prop in flight. Lighting circuit is on a 12A brushed ESC which is on the gear switch. So I can turn the lights on and off from the Tx which is a cool feature. I can also adjust the intensity in the travel end points. I took it for a very brief test flight this morning. Quite impressed with this little plane and would highly recommend it (especially considering its low price) as an aileron trainer. Can loop and roll with encouragement, but not really designed for aerobatics. If you are FPVing or even sport flying you really need a rudder; when turning on aileron/ elevator the nose rides high and should have a touch of rudder to balance the turn. This little plane would be great for a group flying event where everyone got the same plane and tried spot landing and things like that. It would be great to mount NERF darts under the wing and try and bomb a cricket pitch target. Should also be good for night flying - hoping to try this soon. welcome back to the forum, we miss your R/C wisdom !! Holy Crap Glyder! That thing is swwweeettt! Looks like you just showed up again too! I know you'll hate me for saying this buut..You really should put some FPV gear on that..
Gee, sorry gents. The last part of the year was extremely busy - put some pretty serious hours in at work, 6 days a week. Not much forum time left after that. Have also had some health problems but seem to be over the worst of it. You really should put some FPV gear on that..
Nahh - costs too much. I'd far sooner spend that ~$300 on full size flight.